If there is any issue with your internet connection, your smart home is out of luck. So much goes into smart home controls, and most of it is in the Cloud. Have you ever really thought about all that goes on behind the scenes when you give a smart home command? It’s not simply saying “Alexa, turn on the bedroom lamp” and the light goes on – there are a whole lot of relayed commands in between that make the smart home a reality. 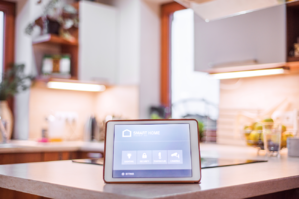 Let’s look at a normal scenario – and you’ll quickly realize a major missing link in the smart home network. So for this example, you have a smart home hub which often is voice-activated (Amazon Alexa, Google Home, etc.). And you have the end point which can be virtually any connected device (TP Link plug, Ring doorbell, etc.) Let’s say you have a smart plug with a lamp connected in your bedroom. There are a lot of factors involved! Two things should pop out as challenges in the above: Latency and Internet Connection. Latency: Wow, those commands have a lot of running around to do. They travel back and forth across the Cloud and to and from the home a lot. Think of how fast your lamp works when you flip a switch. Now think of the latency involved when you issue a voice command on your smart home network. I am fortunate to have 100 Mbps to my house and commands are still a couple of seconds, not instantaneous. Imagine what slower connections will be for latency! Not acceptable in our society where positive customer experience is everything. Internet: As good as the internet may be to my house and yours, it still is a connection and goes down occasionally. Want to make your smart house stupid in less than one second? Disconnect it from the Internet. If all those connections to the Cloud are severed, your house is no longer smart. Nothing is talking to each other or to the Cloud, and therefore, the devices are just expensive useless hardware until you are back online. But wait! There is a solution to this: did you know that Lynx MiND is fully functional, even when there isn’t an active internet connection? In a disconnected “hard environment”, Lynx excels by hosting device controls and the rules engine locally in your gateway, router or set-top box, your devices can be always on and connected to each other even if they are not connected to the Cloud. This is called “disconnected mode.” Since the hosting device is always on, it maintains a local database that contains information about all discovered devices, all collections, rules and scenes that have been created, and user information. This permits users within the home network to access the information directly (via an app running on a device in the home network which does not use the internet to communicate with the hub) to create, edit or delete collections, scenes and rules, and to control devices. Additionally, because the rules are also stored locally, when an event trigger occurs, the corresponding rule(s) will execute, even when there isn’t an active internet connection. And, as the connection is local, latency is reduced to sub-second response time. So as long as it resides within the home network and you have power, it is always on and quickly responds. There are many bonuses to processing locally: for example, latency is greatly reduced (you aren’t going back-and-forth to the Cloud!). And you still have a smart home even if your home is not online. One other point is that I’m fortunate to have dependable and fast fixed broadband because I live in an area that offers it at a reasonable rate: much of the world is not so lucky. A 2017 study shows that the US has an average broadband speed of nearly 75 Mbps. Realistically, some people are getting 150 Mbps and others are still well below 10 Mbps. Outside the US, it varies drastically as well. China averages about 10 Mbps – which will greatly impact the latency for smart home devices. We’ve seen response times be multiple seconds in China which is unacceptable for consumer products. As countries continue to roll out higher speed fixed broadband, smart homes will come in to play as part of the overall services and possibly be a driving force behind higher speeds and reliable services. Until then (and even with these services) the advantages of having local data processing speak loud and clear: smart home capabilities even when disconnected and much lower latency for device response. This is the whole point. Our objective at Lynx is to deliver smart home automation. So, if control sits up in Cloud, latency is irritating but we know that your applications will still work. However, if you lose your connection, smart automated homes become stupid. Lynx MIND resides locally so you won’t lose smart home connectivity. It also solves latency. Plus, you aren’t relying on the Internet which is beyond your control. If it is dark and I’m walking into my bedroom and I tell Alexa to turn on the bedroom light, I would like the light to turn on. Now. Want to learn more about Lynx MIND and how it can help keep your customers' smart homes smart? Email us at contact@lynxtechnology.com now and we will get right back to you!